Chun Hua Catherine Dong's new exhibit "examines the visual culture of shame in relation to the body, subjects and power in contemporary art." In this digital age, it's easy to curate a seemingly idyllic life: your food always looks delicious, your friends are always happy, your partner is always supportive and you're somehow always in the best light. 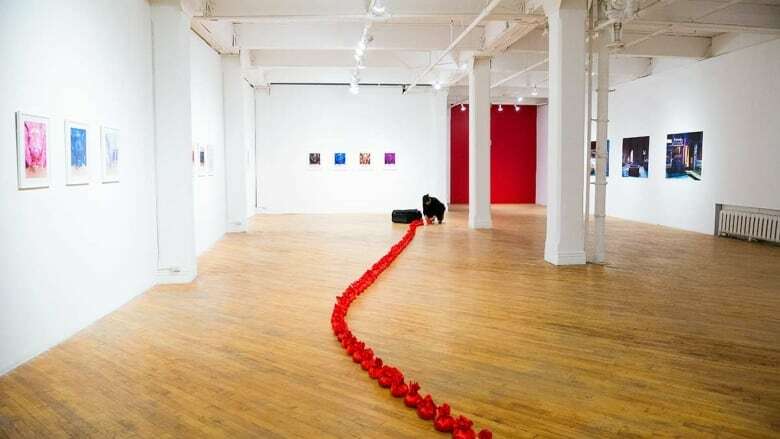 Montreal-based artist Chun Hua Catherine Dong is challenging people to explore an alternative narrative in her show Visual Poetics of Embodied Shame, which runs until December 9th at Winnipeg's Ace Art. 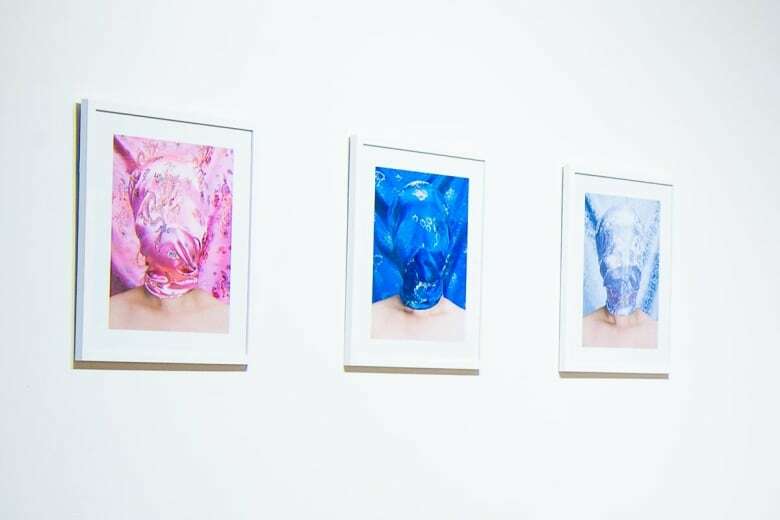 "I hope this exhibition in some degree can provoke people to talk about shame more often because shame is often unspoken and unseen epidemic, and the more it is publicly presented and questioned, the more it can potentially be resisted," Dong tells CBC Arts. The exhibit, which according to the artist statement "examines the visual culture of shame in relation to the body, subjects and power in contemporary art," includes photography, video and installation. 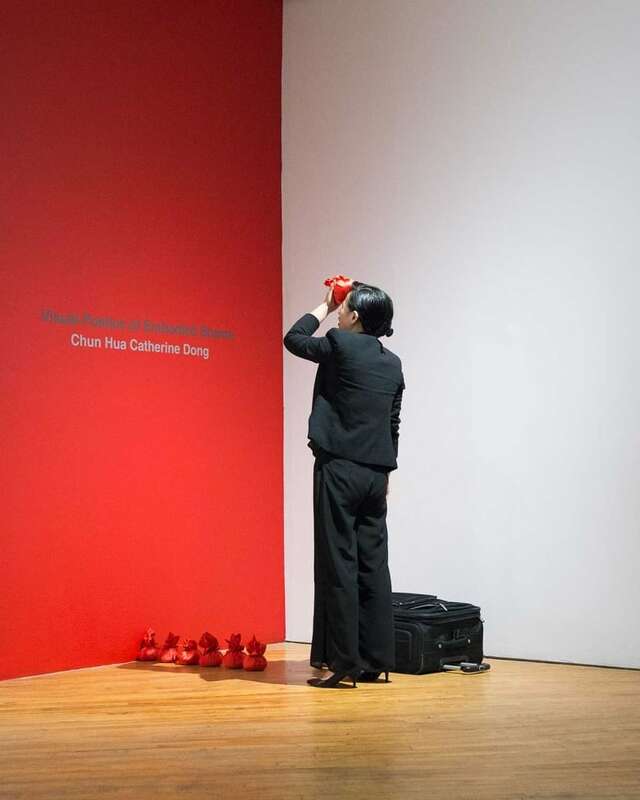 Dong also performed a four-hour performance piece opening night. Ace Art director hanna_g had been aware of Dong's work as an emerging artist and was delighted when, of the 130 submissions Ace receives each year, this exhibit was one of five chosen by the gallery's jury. "We look for an artist who's dealing with cultural concepts in a way that's interrogative and also aesthetically sensitive," she says. With Dong's use of herself as the subject, it could be easy to draw comparisons to selfie culture. Not so, says hannah_g. "She is projecting an alternative to selfie culture; she's showing the power of portraiture and the difference between portraiture and the selfie, and asserting it in a way that is challenging this new medium that is 'the selfie,'" she says. "She's dealing on several levels in this 21st century age of people's bodies being digitally projected but not always having control over that, of young woman exploring aspects of shame, of cultural shame and hiding their identities, or projecting a one-layered or curated image of themselves." Ace Art has commissioned local artist Hannah Doucet to write an accompaniment to the exhibit — a fitting choice, since there are many overlapping themes in the two artists' works. "We both are seemingly fixated on the female body, particularly our own, as a tool to discuss larger issues within representation and perception of bodies in our society," Doucete says. "Where Catherine creates images using her own body as subject to deconstruct a culture of shame, fluctuating between moments of revelation and concealment of the figure, I use my own body fragmented through a process of re-photography to grapple with issues of representation and materiality inherent in the medium of photography. There is a shared criticality of societal and individual pressures within both our work." For Doucete, it's not the comparisons to selfie culture that are noteworthy; rather, it's the idea of shame as an act of resistance. "I think the most interesting part of the exhibition is the way Catherine positions shame as, in her words, 'a feminist strategy of resistance.' This idea confuses and intrigues me. Shame is so often used as a tool to further subjugate those in positions of lesser power — how can we shift this to have positive implications as a form of feminist resistance?" She adds, "In her artist talk, Catherine talks about making shame visible, and with that, the shame becomes a power instead of vulnerability. I am not entirely convinced by this explanation,and still wrestling with this idea, but I think the idea of reclaiming shame as vulnerability is one of the more thought provoking moments within the exhibition."